Helen Svitak, 91, of David City, died Saturday, May 14, 2016 at the Butler County Health Care Center in David City. Helen was born June 15, 1924 on a farm near Brainard, Nebraska, to James and Julia (Kobza) Svoboda. She attended David City Public Schools and graduated from David City High School in 1943. On February 5, 1948, Helen was united in marriage to James Svitak in David City, Nebraska. 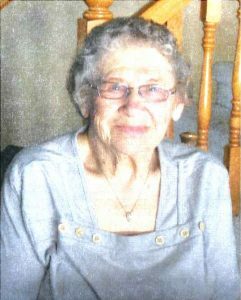 Helen had lived in the David City area all her life, having worked at Henningsen foods, and cleaning at the First National Bank. Helen loved to play bingo at the V.F.W. hall and the K.C. hall in David City. She was also a member of St. Mary’s Catholic Church. Helen is survived by her daughters, Cheryl (Terry) Hughes of Brainard, Julie(Joe) Mach of Lincoln, Two grandchildren, Jenny Hughes and fiancé Connor Holsclaw of Lincoln, Jeana Mach of Lincoln, and her special friend Tracy Saathoff of Beatrice. Sisters-in-law Lucille Svoboda of Santa Ana, California, Dorothy Meador of Mountain Home, Arkansas. Many nieces and nephews. She was preceded in death by her parents, husband James in October of 1990, 6 brothers, Louis, Jimmy, Emil, William, Theodore and Julius. Sisters in law Emily and Dorothy Svoboda, nephew John Svoboda.